Go for a jaunt from Punta Cana to Parque Nacional del Este to see Isla Saona about 1h 10 min away. Spend the 28th (Wed) spotting exotic species with a safari tour. There's still lots to do: stroll through Bavaro Beach, get close to the beloved marine mammals with a swim-with-the-dolphins experience, stop by Life is good, and kick back and relax at Macao Beach. To see maps, other places to visit, more things to do, and more tourist information, read Punta Cana online itinerary creator. Portland, USA to Punta Cana is an approximately 14.5-hour flight. Due to the time zone difference, you'll lose 1 hour traveling from Portland to Punta Cana. In March, Punta Cana is much hotter than Portland - with highs of 83°F and lows of 71°F. 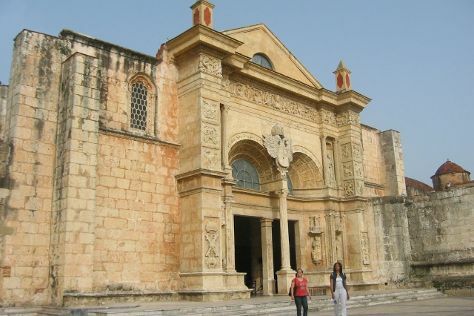 Finish your sightseeing early on the 28th (Wed) to allow enough time to travel to Santo Domingo. Santo Domingo, the capital of the Dominican Republic, remains the oldest continuously inhabited settlement in the New World. Kick off your visit on the 29th (Thu): get a sense of history and politics at National Palace and then don't miss a visit to Zona Colonial. Here are some ideas for day two: explore the historical opulence of Alcazar de Colon, then steep yourself in history at Fort Ozama, then take in the spiritual surroundings of Catedral Primada de America, and finally see the interesting displays at Columbus Lighthouse. For reviews, traveler tips, maps, and tourist information, you can read our Santo Domingo trip generator. Traveling by shuttle from Punta Cana to Santo Domingo takes 2.5 hours. Alternatively, you can drive; or take a bus. Expect a daytime high around 88°F in March, and nighttime lows around 71°F. Cap off your sightseeing on the 30th (Fri) early enough to travel back home.